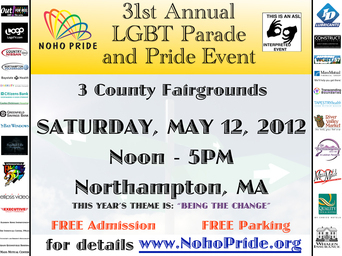 This year’s NoHoPride march and rally theme is taken from the words of Mohandas Gandhi: “You must BE the change you wish to see in the world.” This message speaks directly to the purpose and spirit of every Pride event – the call to promote and exemplify a positive presence in the world. Gandhi is often referred to as “Mahatma”, which is Sanskrit for “Great Soul”. He was a devout Hindu and a committed practitioner of the ancient spiritual tradition of ahimsa (non-violence). Gandhi pioneered nonviolent protest and mass civil disobedience to achieve social and political change and his methods have inspired the efforts of many successful activists including Dr. Martin Luther King, Jr., Nelson Mandela, and Cesar Chavez. According to Chavez, “The first principal of nonviolent action is that of noncooperation with everything humiliating.” Pride events are held around the world to commemorate the morning of June 28, 1969 as the official date of our collective “declaration of noncooperation”. LGBTQ activism began in earnest with the Stonewall riots as a spontaneous uprising that swung the pendulum wide in favor of our asserted disobedience. That event was a turning point from which we have continued to persevere toward the goals of freedom and equality. Since the Stonewall riots, our community has sought more peaceable means to effect the changes we wish to see in the world. We have organized, galvanized, and institutionalized actions for human rights. We have committed ourselves to the journey of change. We have learned to stay the course, cultivate the necessary endurance, and celebrate the incremental accomplishment of every step. However slow the gains might be in coming, our steadfast dedication advances us toward lasting and productive strides in the direction of social justice. We understand that meaningful change requires focused perseverance as progress is often a process. When Gandhi exhorted his audience with the words, “be the change you wish to see in the world”, he was declaring that the quality of our own experience must not depend upon how, when, or if other people change because our experience is not contingent upon others. If things are to change for us they must first change within us because externalized change begins as an inside job. Change evolves, clarifies, cultivates, actualizes, and refines. If we wish to see positive change in the world, we must first take responsibility for the dynamics of change at the interior level of our own lives, then outwardly project them. As we practice non-violence toward ourselves we learn how to extend the attitude of harmlessness to others. In this way, change on the inside produces change on the outside – the kinds of change that enhance our personal and collective experience, extend personal freedoms, and celebrate the innate value of each precious life. We are taking to heart the deep wisdom within this idea. We are changing our minds, our postures, and our approaches. We are molding ourselves, our families, and our community in assorted shapes of dignity. We recognize the merits of taking the long view and planting seeds for future harvest. We are rooting change for generations to come. The LGBTQ community is creating cultural change in the manner which Gandhi exemplified throughout his life and work – promoting well-being rather than injury. We are working constructively for social justice, advancing the mission of equality through activism that increases awareness of issues that are important to all people. We are dynamically demonstrating the power of “being the change we wish to see” from the inside, out. As we continue to creatively confront the challenges before us and align our actions with a vision for collaborative community, we prove our dignity through progress and model the face of authentic pride!